Poet and lyrist R K Dhamodharan has been selected for the 2018 Pavakulathamma Award as part of Pongala Maholsawam at Pavakulam Devi temple in Kaloor, Kochi. KOCHI: Poet and lyrist R K Dhamodharan has been selected for the 2018 Pavakulathamma Award as part of Pongala Maholsawam at Pavakulam Devi temple in Kaloor, Kochi. A jury comprising Justice M Ramachandran, Poet S Rameshan Nair and VHP state head S J R Kumar selected R K Dhamodharan for the award. 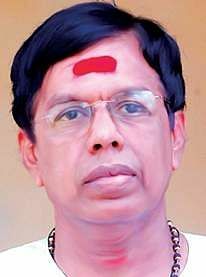 The award will be presented to him at a function organised as part of the Pavakulam temple festival on April 22. The award comprises a cash prize of `10,001 and citation.